This morning at work I was asked to complete a survey. The last question I refused to answer due to the ignorance of whomever chose the possible answers. Let me start with Caucasian. Many forms use this term to mean “White”. Caucasian is actually a group of people from the Caucasus region, e.g. – Georgia, Croatia, Turkey, Armenia, Russia, Azerbaijan, and Iran. A good answer if you happen to be from any of these countries, which I am not. Asian? This is such a broad cross section of people from a very large region, cultures, and religious beliefs. If I were from any of the countries that make up “Asian”, I would be as upset as being labeled Caucasian (White). Black? If you are not going to use “white” on the form, why use “black”? There are many people groups that share the same dark complexion which is controlled by the amount and distribution of melanosomes in the skin. The two main types of melanin are eumelanin and pheomelanin. Skin color really has nothing to do with race nor ethnicity. Let alone your ability to do your job. It is my understanding that it is no longer politically acceptable to say someone is Mexican in the U.S. It is now Hispanic which refers to Spanish speaking people. Not a race nor ethnic group. What happens if you are fluent in English and Spanish? Multi ethnicity is a new category to me. That would cover a very large group of people, especially here in the melting pot of American. Single ethnicity not listed above. Most of the world has been carved up into countries with boarders that split ethnic groups among two different countries. The Kurdish people come to mind as an ethnic group. 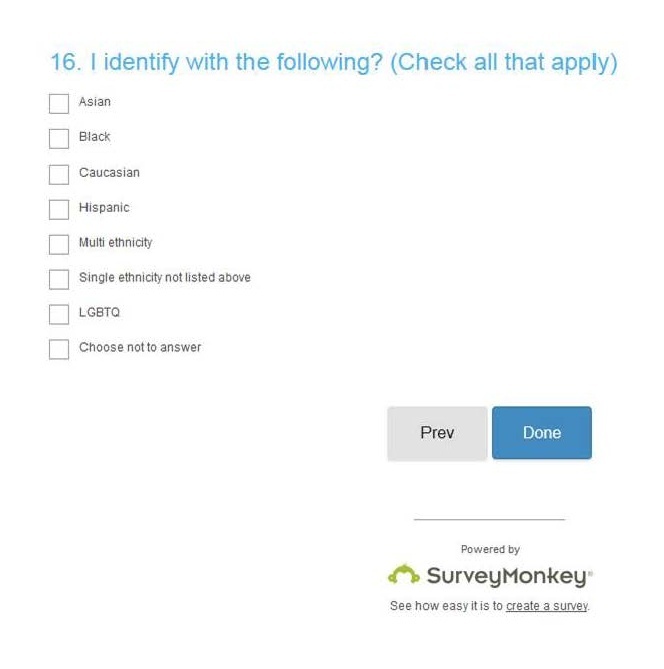 From my perspective, LGBTQ does not seem to fit in this question since sexual orientation has nothing to do with doing one’s job let alone their ethnic group. Choose not to answer would be the best choice because it does not really matter. But my real disappointment is that fact that there was no “Other” where I could write in my answer. Our associate director stated it would take only fifteen minutes to complete the survey. The survey was delayed three days due to the firewall. Then when it was sent out, most of us clicked to start the survey and it took us to the end thanking us for our input. They got off to a really bad start. When I finally saw the questions, I told my supervisor that it would take me at least an hour. Big mistake to leave areas to write in additional comments with no word limits. Last time our directorate asked for input as to how they were doing, they did not like the survey results and never shared what they learned. No one is holding their breath on knowing the results of this survey either. Seems like maybe multi-ethnicity might be the best answer — that covers a bunch and doesn’t tell anyone anything. 🙂 Practically everyone could check that one. I usually just check prefer not to answer. And you were the one who originally gave me the best answer — Human.